In assessing the credibility of elections, attention has for the most part focused on the activities leading up to an election, as well as the voting and counting. Indeed, three stages of the electoral process that take place before votes are counted have long dominated the discussion; namely (1) voter registration, (2) candidate registration and (3) the voting process. The general consensus has been that an election cannot be deemed to be credible without all three of these phases having been carried out correctly. entire electoral process, rendering irrelevant the success and acceptance of all the other stages. A key lesson must be learnt: if there is to be trust, then transparency, accuracy and accountability are essential. A similar situation occurred in the aftermath of the Jordanian 2013 House of Representatives´elections. Unlike in Kenya six years earlier, however, the confusion that arose from announcing different provisional results was addressed quickly and efficiently thanks to the electoral management body´s own electronic verification system, which detected the differences and allowed for a proper investigation to take place and ended in the release of final results. The lesson learnt in Jordan was that verification systems should be in place and properly implemented, including a precise timeline that outlines the various steps needed to verify results before releasing preliminary results. Also, all relevant stakeholders need to be aware of such systems. 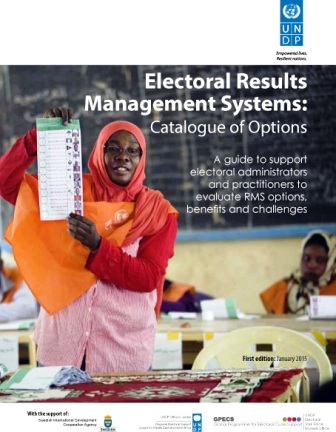 A focus on election results management systems ensures that equal consideration is given to activities taking place in the aftermath of polling. An election results management system (RMS) is defined as the process by which an election authority counts, tabulates, aggregates and announces the results of an election, which starts immediately after the closing of polling and ends with the final results. Intrinsic to any successful RMS is the continuation of transparency right through to the end, including during and after votes are counted. Also extremely important is how an electoral dispute resolution system is managed regarding any complaints and challenges to the results at various stages. This publication does not represent United Nations policy of official positions. Instead, is intended to be a catalogue which offers a description of the main RMS options as well as their benefits and challenges. The aim of the publication is to support electoral administrations to take informed decisions when evaluating a potential RMS to be used.